The smallest acts of kindness can make the biggest impacts of all. Martin Richard knew that, and I’m happy to be part of Social Good Mom’s campaign to spread Martin’s acts of kindness. 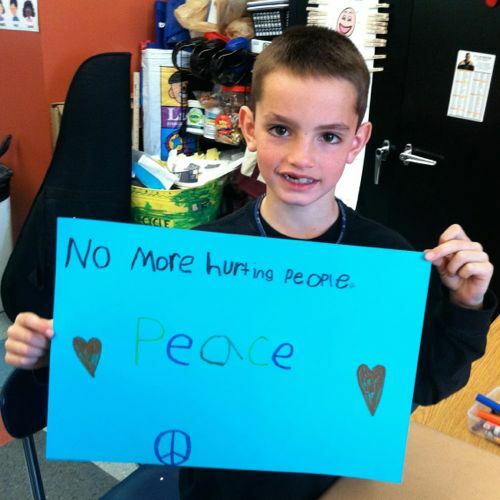 Martin was an 8-year-old boy with a beautiful spirit, tragically killed by the Boston Marathon bombing. During his short life, he was a “bridge builder” at his school. What does that mean? Martin believed that everyone deserved to be treated kindly, compassionately and with respect. His simple hand drawn sign reading “No More Hurting People, Peace,” has inspired so many people to live up to the example set by this sweet little boy. Hasbro was among the inspired. Back in 2010, they helped to found generationOn, the youth division of Points of Light. Now, they’re teaming up with the organization to join forces with the Martin Richard Foundation on the Martin Richard Bridge Builders campaign. This campaign highlights ten easy yet meaningful projects that parents and kids can do together to help spread Martin’s message of peace. Jacob and I chose Small Acts, Big Impact, a journaling project that not only promotes small acts of kindness, but also helps us remember what we’re most grateful for. Throughout the project, we’ll be finding ways to incorporate random acts of kindness (A-OKs) into our everyday life. Jacob is already a kind child. Throughout his years at school, he’s always shared his school store money with kids who didn’t have any, invited younger children to sit with him on the bus when they’re nervous and always insists that I say “yes” when asked if I want to donate to homeless animals at the checkout. For me, the goal of the project isn’t just to make sure we’re spreading kindness. I feel like we’re pretty good in that department. It’s to get both Jacob and I reflecting more on what we have. I’ve been super stressed lately. My car’s transmission went, which cost me pretty much my entire savings. My dog is sick. But we also have so many good things in our life. I got my car back finally, and even though I know my mechanic had to pay a little more than the quoted rate for my transmission, he did not pass that extra on to me. That was an incredible act of kindness on his part. Jacob was sick with a sore throat, BUT he got to stay home from school because of it and catch up on his favorite TV show. We take the silver lining where we get them, and when you’re a kid, sometimes a sick day is a blessing in disguise if you’re just sick enough that you have to stay home but not so sick that you can’t enjoy it! 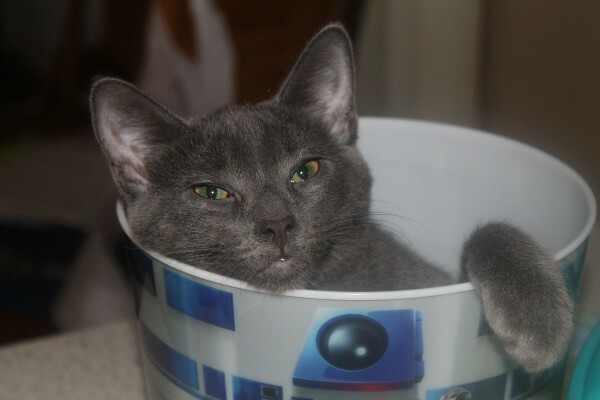 My kitten was in rare form, being utterly hilarious all night and cracking us up with her antics. She almost gave me heart failure when she “popped” out of the popcorn bucket after a nap! That made us think of how our pets make our “good things” list every day, just by being them, which in turn makes us think of all the other little good things we’re grateful for. Want to get involved? From now through October 16, you and your family (kids & teens welcome!) can visit the campaign website (generationOn.org/peace) to learn how to create peace in your community. Share your own ideas and random acts of kindness on social media using the hashtag#NoMoreHurtingPeople. If you happen to live in or near Newport Beach, California, head to the Balboa Pier on Sunday, September 20 for a “Pier to Peer” event managed by Team Kids. The event features participants lined up and holding peace posters, stretching across 1.7 miles of beach. For a $5 registration fee, you can create your own peace posters at the event, enjoy a pancake breakfast, play games and listen to music, all while helping to spread Martin’s message of peace. On World Peace Day, September 21st, join us for a great celebration of peace and giving. 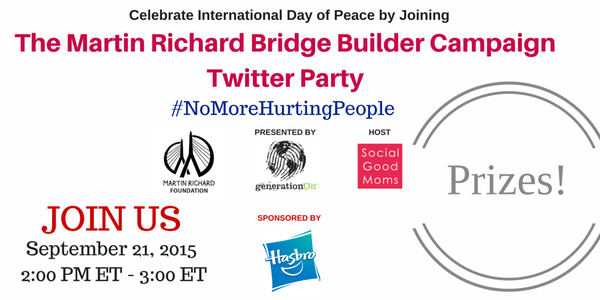 Follow the hashtag #NoMoreHurtingPeople on Twitter at 2PM EST to 3PM. The party is sponsored by Hasbro and hosted by Social Good Moms. Of course, there will also be fantastic prizes! What little things do you to do make a difference and teach your kids about kindness? This sounds like a wonderful campaign. I think small, random acts of kindness are some of the best things in life. What a lovely enlightening post! Your kitten is adorable and looks like a little version of one of my cats! I love that you try to find the silver lining in all things! WOW! I really love this blog post. I am going to with my daughter and son help show acts of random kindess during the next weeks and help share Martin’s story of peace to help bless others. He is such in inspiration! What a wonderful lesson to teach our children. It’s a great campaign for sure! Have your kids check into the Butterfly Effect Program that I wrote about here http://craftoflaughter.com/butterfly-effect-one-person-can-change-world/ There are grants available to help kids make a difference. What a great campaign! I firmly believe in teaching our children to be kind, generous and for sure that small acts of kindness go a long way! This is such a great campaign, and how much happier would we all be if the kindness would truly catch on? Who doesn’t think that everyone should be treated with care, decency, and respect? I hope that this campaign grows legs and spreads like crazy! Wonderful idea! It is so important to raise awareness with our youth today. I must say that my kids were very lucky as they were growing up. The school did not tolerate kids who were disrespectful. Not the case, unfortunately, in other schools. What a wonderful campaign! It’s so important to teach kids nowadays how to be kind and considerate. And how small gestures can have positive impacts on others! I definitely will be attending the Twitter party. This is such a great campaign. It’s so important. This is incredible action! It’s so important to teach our kids how to be beautiful humans from early age.